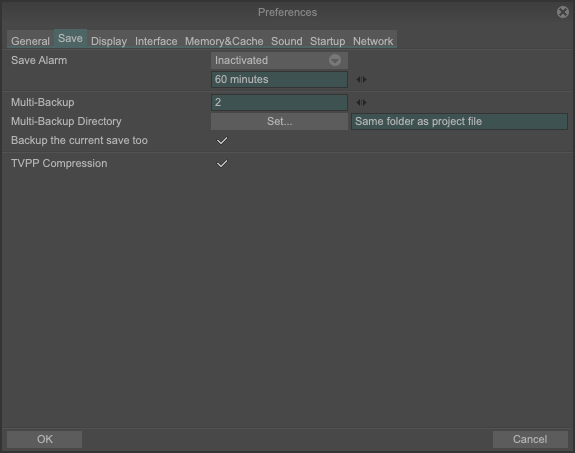 This option automatically saves your file and also generates a backup file at the given interval starting from the moment you change your project. In case of some loss of information (due to crash, lost file, human error, corrupted file etc…), you can always have at least one recovery file available. In addition, every time you manually save your file by keyboard command [CTRL + S] or by selecting File > Save from the Main Menu, TVPaint Animation will likewise generate a backup file. For even more safety, you can instruct TVPaint Animation to save a given number of successive backups. After that number of backups has been reached, TVPaint will start repeatedly saving over those backups in succession, starting with the oldest. In the present case, "2" is written in the Auto Backup. This means each time you will save, there will be a shift between two backup files, plus a save on the main file (which is the one ending with the suffix “.tvpp”). Backup files are saved at the same place than the original .tvpp project and are named as follow : file_name.tvpp.Year.Month.Day.Hour.Minute.Second. Each time you will save, the oldest file will be modified, with a new date and hour. To open a backup file, you just have to delete the part with numbers, in order to keep only file_name.tvpp. You can also drag and drop the file directly into TVPaint Animation. - The last section TVPP compression allows you to compress the size of your TVPaint files (.tvpp) but keeps the same image quality. Compressed files cannot be read by TVPaint Animation versions older than the 10.5.0 version.